Pill uses a dissolving spring-loaded needle to spare people with diabetes from normal injections. (Inside Science) -- A pill shaped like a tortoise could one day help deliver insulin to people with diabetes, a new study finds. Researchers have long sought ways to deliver insulin using pills instead of unpleasant injections. However, many medications are vulnerable to the acidity and digestive enzymes found in the digestive tract. To overcome this challenge, researchers have developed an easily swallowed blueberry-sized capsule that can inject delicate molecules into the stomach lining. The stomach wall has no pain receptors, so the scientists believe that patients should not feel the injection. To help the device settle against the inside of the stomach, the researchers drew inspiration from the leopard tortoise, which is found in eastern and southern Africa. The reptile's domelike shell helps the tortoise right itself if it rolls onto its back. 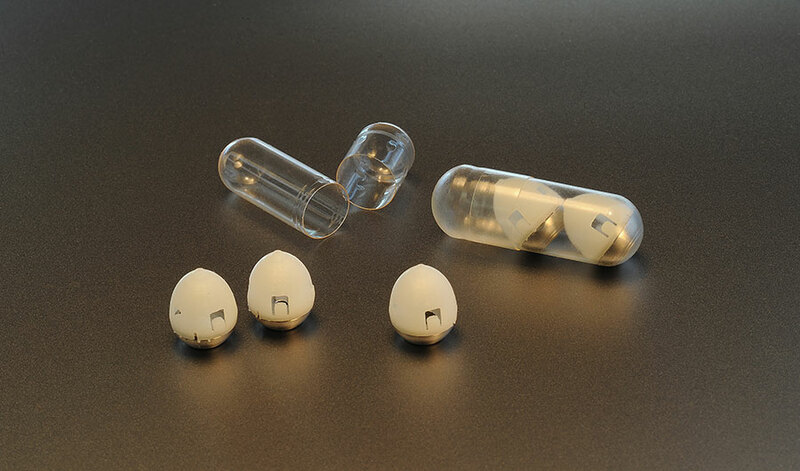 A similar shape would likely help the capsule orient itself along the bottom of the stomach wall to ensure its needle could find purchase, despite any forces that may jostle it about. The tip of the device's needle, made of freeze-dried insulin, is attached to a compressed spring that is held in place by a disk made of sugar. When water in the stomach dissolves the disk, the spring releases and injects the needle into the stomach wall. In tests in pigs, the device successfully delivered up to 0.3 milligrams of insulin, enough to lower blood sugar to levels comparable to those produced via traditional injections. The scientists could also increase the dose to 5 milligrams, comparable to what someone with Type 2 diabetes would need. The researchers saw no sign of tissue damage or other problems from the stomach injections. The device is made from biodegradable materials and stainless steel parts that should allow it to pass harmlessly through the gut after delivering the insulin. Experiments also showed the device -- dubbed the self-orienting, millimeter-scale applicator, or SOMA -- could work for other drugs currently delivered via injection. "We anticipate our first human trials in the next three to five years," said study co-senior author Giovanni Traverso, a gastroenterologist and biomedical engineer at Harvard Medical School in Boston. The scientists detailed their findings in the Feb. 8 issue of the journal Science.